Baking is both a science and an art, given that it requires both precision and creativity. Once you’ve baked your fair share of treats, you realize that just because the recipe in the book says to use a cup of this and a teaspoon of that, you sometimes need to improvise. Why is this necessary? It all depends on the conditions under which a recipe has been tested, and the conditions under which you’re baking, which might be very different. Perhaps the test kitchen is in New York City, and you’re baking in New Orleans. Maybe the recipe was tested on a day in the middle of November, and you’re baking in the middle of July. Perhaps the test kitchen baker didn’t let her butter soften as much as yours, or she used a different kind of baking sheet. Whatever the reason, you’ll usually know if you need to improvise as soon as you’ve finished mixing it according to the source’s instructions, and you’ll most definitely know after your first batch has baked. I suspected that I’d need to add more flour right after I finished mixing my dough, but I baked one test batch just to be sure, and I was proven right. This recipe includes more flour than Martha’s original, but I also fully acknowledge that it’s 88 degrees in Pittsburgh and very humid today, so the next time I make these, I might not need it. Preheat oven to 325 degrees. Line four baking sheets with parchment. In a small bowl, sift flour and kosher salt together; set aside. In a mixing bowl, cream together butter and brown sugar, scraping the sides of the bowl as necessary. With the mixer running on low, slowly beat in flour mixture until just combined. Using a 1-inch cookie scoop, scoop dough onto prepared baking sheets, spacing about 2 inches apart (you should have 9 cookies per sheet for optimal baking). 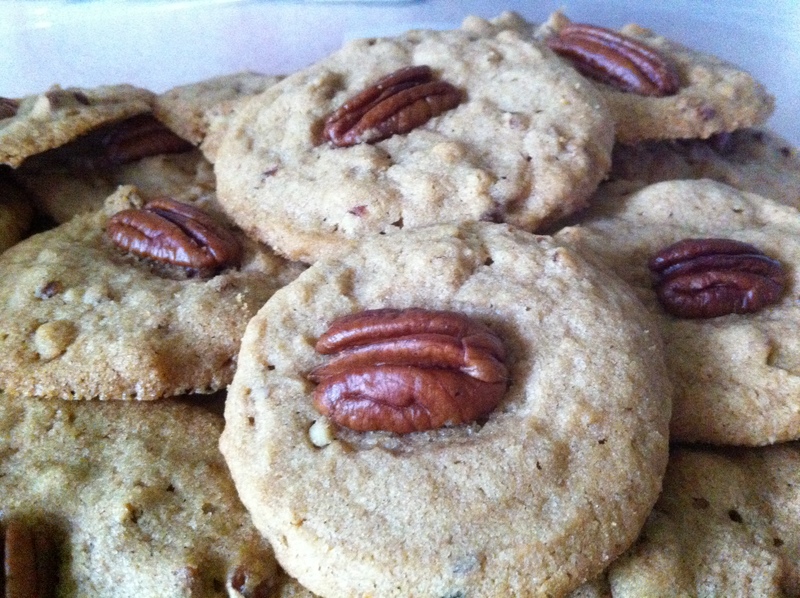 Press a pecan half into the top of each cookie. Bake for 12-15 minutes, until edges are just golden. Cool on cookie sheets for 2-3 minutes, then place on a wire rack to cool completely.